Ottawa, Ontario – The Ottawa Jr. 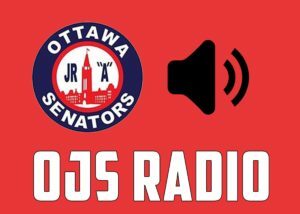 Senators defeated Hawkesbury (5-1) and Kanata (3-2) this weekend, improving their record to 35-13-3. With the two wins, Ottawa also jumps to the top of the Yzerman Division and to third in the CCHL’s standings with 73-points. They are just two points behind the Carleton Place Canadians for first in the league. On Friday night, Francis Boisvert made 46-saves on 47-shots for the victory. Elie Boulerice scored twice, giving him 20-goals in a season for the first time in his career. Taylor Egan scored the game-winning-goal and finished the game with 1G/2A. The Jr. Senators take a 3-1 season series lead with one more game against the Hawks. On Sunday evening, Declan Hilton’s second period goal turned out to be the difference, as Ottawa won by just one. Geoff Dempster opened the scoring with his 20th and Joshua Ward made 24-saves – as the Jr. Senators win their fifth game in a row against Kanata and their fourth consecutive game overall. The Ottawa Jr. Senators next game will go down this Friday on the road in Pembroke. If you can’t make it out, catch the radio broadcast on mixlr.com/ojsradio.